Excessive rainwater during the rainy season and lack of water in the dry season have been challenging the agricultural productivity and food security for rural communities in southern Mali. Various soil and water conservation practices were implemented in the past to improve crop yields and income, and reverse the effect of land degradation. However, none of these efforts looked into the potential use of shallow wells at a spatial scale to improve the agricultural productivity and hence the food security in the region. In total 484 shallow wells were geo-referenced, mapped and studied in two districts, Bougouni and Koutiala, in southern Mali to understand the dynamics of groundwater recharge and relationship with rainfall in different seasons. The study found out that shallow wells were mainly utilized for household and livestock water consumption and not for agricultural water use. Well construction history followed the trend of the severe drought that hit the Sahel in the years of the 1970s and 1980s. Majority of wells (87 % in Bougouni and 84 % in Koutiala) were constructed after the drought period with significant variation of construction in the two districts (p value 0.032). Well depths ranged from 1 to 150 m, with the majority of wells (64 %) within the depth range of 6.5–14.5 m (p value 0.043). During the dry season water was available in the majority of wells (73 %) at a depth range from 5.5 to 15.5 m (p value 0.996). In the rainy season on average 84 % of wells in Bougouni and 94 % of wells in Koutiala experience water level rise within the range of 0.5–10.5 m (p value 0.423/Bougouni and 0.991/Koutiala). In few of the studied villages shallow wells were found to be fast recharging, thus enabling farmers to buffer the negative effects of drought conditions. Shallow wells are important sources of water in rural Mali. The wells have adequate recharging capacity during the rainy season and insignificant water level variation during the dry season. Though accessing water from shallow wells was labour-intensive and mostly done by women and the youth, water is available within an average depth ranging from 5.5 to 15.5 m from most studied wells. The issue of water scarcity in different seasons was thus attributed to accessibility due to the lack of appropriate water lifting mechanisms. Groundwater was an untapped resource in Mali, and we suggest groundwater management needs to be given consideration along with other management practices in the changing climate condition to improve the agricultural productivity and food security. Climate change, land degradation, population growth and over reliance on rainfed agriculture are common social and biophysical constraints to increased agricultural productivity in developing countries particularly those of rural communities of sub-Saharan Africa . The soils of sub-Saharan Africa are inherently poor in fertility characterized by low productivity, and in addition to nutrient scarcity, land degradation and water stress hamper considerably the agricultural development of the region . These daunting challenges constitute potential setbacks for agricultural development efforts in many countries of sub-Saharan Africa including Mali. Located in West Africa and land locked, Mali is one of the least developed countries with an economy that relies heavily on rainfed agriculture and livestock . Smallholder agricultural production is dominated by rainfed production of millet, sorghum and maize for meeting food demands and on cotton for the market. Agricultural production is inadequate to feed Mali’s population, which is growing at a rate of nearly 3 % per year and at present over a quarter of Mali’s population is undernourished . The Malian economy is based mainly on cotton export which contributes 10 % of the national GDP and constitutes the main source of cash for 2.5 million of farmers in the southern part . Challenges faced by farmers in Mali particularly in the southern part include among others, excessive rainwater during the rainy season, scarcity of water in the dry season, soil acidity and nutrient depletion , rapid land degradation caused by decades of intensive and extensive cotton cultivation , and high costs of fertilizers that contribute to low crop yields , consequently making poverty rampant . It was also recognized that yield gaps in the semi-arid regions of West Africa are results of inefficient land, water and crop management practices . Soil erosion by wind and water and soil physical degradation, for example crust development, are important processes of soil degradation in southern Mali. During the droughts of the 1970s and 1980s, bare soils were vulnerable to wind erosion, and large areas lost most of their top soils. Winds transported the eroded soils (dust) and deposited them elsewhere forming new layers of topsoil up to a decimetre thick. Substantial water run-off and soil erosion usually occur on these soils when surface run-off is high , and this erosion is often observed in areas with compacted soils having low water infiltration capacity. Thus, run-off and wind contribute to soil degradation through erosion of the upper layers which ultimately reduce water availability for crops and trees of the parkland . In southern Mali, the estimated water run-off was at 20–40 % of annual rainfall and up to 70 % of individual rainstorms . Soil losses in cultivated soils were 25 kg of N ha−1 year−1 and 20 kg of K ha−1 year−1. The conclusion was that 44 % of the losses in farmers’ incomes were due to soil depletion . Southern Mali receives mean annual rainfall ranging from 500 to 1000 mm with strong variations and irregular rainfall events most of the times . Water scarcity associated with rainfall variability poses one of the biggest obstacles to the achievement of food security and poverty reduction in the region. Recent reports [16–18] indicated that in West African countries rainfall has become less reliable and growing seasons are shorter in many areas, which inevitably require a radical shift in farming and natural resource management practices. Various soil and water management practices were implemented by local communities with the main objective of improving crop yields and reversing the effect of land degradation such as water erosion from farm fields. The commonly applied field level technologies include live fencing and grass strips , compost with mineral fertilizers [19, 20], zaï or pit planting with organic amendments [21, 22], stone and contour bunding [23, 24], half-moon techniques [21, 25] and gully interventions . However, these methods were piecemeal efforts that did not evolve into precise and efficient soil degradation control measures as they are labour-intensive and, with the increasing annual levels of degradation, only translated into marginal yield increase that is not sustainable . A report by Jalloh et al. highlighted that significant decline in crop yields is expected until 2050 in West Africa Sahel if no further adaptation measures are taken. Zougmoré et al. argued that loss of water through run-off, soil evaporation and drainage below the root zone account for the water deficiency (longer periods of water stress). This water, however, if managed properly could easily be used to recharge shallow wells to enhance the groundwater storage. Most efforts in the past focused on land management practices with little attention to improve aquifer recharge. In southern Mali in particular there were few studies that looked into the potential use of shallow wells to store the excess rainwater and supplement water shortages in different seasons to improve food security. Groundwater provides a reliable, high quality and accessible sources of fresh water that enables farmers to militate against the production risks associated with extreme weather events and climate variability . The current study was conducted to understand the recharging capacities of existing shallow wells in different seasons as a potential groundwater source to improve the current agricultural productivity and incomes (food security) in southern Mali. Using 484 shallow wells spatially spread in ten farming communities, we tested and presented availability of water for various purposes in different seasons. The study was conducted in ten farming communities located in the two districts of Sikasso region in southern Mali (Fig. 1). In Bougouni district, the target communities were Dieba, Flola, Madina, Sibirila and Yorobougoula. Similarly, the five target communities in Koutiala district were M’Pessoba, Nampossela, N’Golonianasso, Sirakele and Zanzoni. Table 1 presents the communes in which the farming communities belong along with the geographic coordinates, population and the wet season rainfall data. Five ordinary rain gauges were installed in each farming community in August 2014. From one-year rainfall data (2014–2015), seasonal variation of rainfall (averaged for each district) is presented in Fig. 2. The computed total wet season data for Koutiala and Bougouni districts were 743 and 1062 mm, respectively. Though data were of short duration, it showed an increasing trend of rainfall southwards, with the dry season from October to May and wet season from June to September (Fig. 2). As there were no climatic monitoring stations in the studied farming communities, the station at Koutiala weather station located in Koutiala district (latitude 12.38 and longitude −5.47) was used to study seasonal variation of climatic variables and potential evapotranspiration (PET). Seasonal variation of temperature and rainfall data from records of 31 years is presented in Fig. 3. Accordingly, rainfall was mono-modal, starts in May, peaks in August and ends in October. The historical daily maximum rainfall recorded was 97 mm (on 2 August 1998), and the long-term average number of rainy days in a year was 193. Similarly, the historical maximum and minimum temperatures recorded were 43 and 8 °C, respectively. Records of maximum temperature begin to drop during the rainy season having similar pattern as that of minimum temperature. The seasonal pattern of PET along with rainfall is presented in Fig. 4. The computed mean annual PET (MAE) was 1752 mm. PET was higher than rainfall for 9 months of the year (October–June) signifying the aridity of the environment. During the 31 years (1980–2010), it was evident that slight increase in rainfall was observed (statistically insignificant) (Fig. 4). Literature data indicate that the dominant soils in southern Mali are Arenosols, Lixisols and Acrisols. These soils are inherently fragile, low in carbon and poor in plant nutrients . Few studies on soil analysis in southern Mali [29, 30] demonstrated that light-textured topsoil (8 % clay) covers heavy-textured subsoil (20–28 % clay). Soils lack phosphorus, nitrogen, organic content and water retention capacity. In addition, the composition of many soils (high levels of sand and silt and low levels of clay) makes them highly prone to crusting through raindrop impact, especially during the first storms . As a result, water run-off rates of 40 % of total annual rainfall are common in these landscapes. The bedrock geology in the study area is mainly composed of pre-Cambrian rocks (granites and sandstones) that are deeply weathered. The heavier rains in the south have leached the nutrients down the soil profiles, making the soils therefore generally poorer. In hilly terrain, weathering of rocks and soils is accompanied by a downward flow of water which leaches and transports the more easily soluble nutrients from hills to valleys. This process typically creates a sequence of soils from hills to valleys, termed a catena. The major staple crops grown in the area are millet (Pennisetum glaucum) and sorghum (Sorghum bicolor), and maize (Zea mays) becomes dominant southwards. Also largely present in the two districts are groundnuts (Arachis hypogoea) and cotton (Gossypium sp.). Other more water-demanding crops including rice (Oryza sp.) also grow in irrigated fields adjacent to the rivers or in flood-recession areas and in lowland plains of the southern Sudanian and Northern Guinean zones. Vegetable gardening and fruit trees are also widely included in the production system. The irregular distribution of rainfall in time and space risk within-season dry spells which influences cropping choices. The production potential in the region is considerably low due to the frequency of droughts and other yield-reducing factors such as pests, diseases and weeds. Smallholder farmers get little income from millet and sorghum, the major cereal crops in the region, because of high risks of crop failure and poor road infrastructures and access to markets in rural areas. From June to September 2014, 484 shallow wells were inventoried and geo-referenced in the ten farming communities. The sampling procedure for spatial monitoring followed a two-step process: (1) considering the total number of shallow wells spread across a wide range of area, an expert decision was made to consider all wells for analysis if the total number of wells was ≤50 in each farming community, and (2) the relative distance of each farming community from a nearby accessible road for data monitoring was considered. In the second case cities of Bougouni and Koutiala were considered as reference locations. For example, the farming community in Yorobougoula was 125 km on a rough road from Bougouni City (285 km from Bamako, Mali’s capital). Considering the above two factors representative well data were collected spatially without excessive cost of operation. Hence, in Bougouni district all wells were considered and for Yorobougoula farming community 30 % of wells were randomly selected. In Koutiala district, all wells were considered for Nampossela and Sirakele farming communities. In the remaining three farming communities, representative sampling of 50 % of wells in Zanzoni and 70 % of wells in each N’Golonianasso and M’Pessoba was considered. Following field inventory and geo-referencing, biophysical characterization of shallow wells was studied to understand groundwater recharge characteristic considering year and depth of well construction, seasonal variation of water level, use of the well, number of households using the well and conflicts over the use of wells. In an area of scarce water accessibility like that of southern Mali, monitoring shallow wells provides data to develop and provide efficient groundwater management strategies in different seasons to ensure sustainable supply of the resource with the community of practice. In this case shallow wells were monitored through standard questionnaire where each well owner was interviewed to provide the required data. Information received from well owners regarding water level data was validated using shallow well monitoring device, the Dip meter, purchased from SEBA Hydrometrie GmbH1 (http://www.seba.de) (Fig. 5). The location of geo-referenced wells in the two districts along with installed monitoring stations for rainfall measurement is presented in Fig. 6 together with the 2015 projected population data obtained from Columbia University Center for International Earth Science Information Network (CIESIN) and Centro Internacional de Agricultura Tropical (CIAT) . Finally, data were analysed using SPSS software to study the statistical variation in depth of well construction and water level variation in different seasons. The history of shallow well construction followed the trend of the severe drought that hit the Sahel in the years of the 1970s and 1980s. Major episodes of drought and food shortage started in the late 1960s and continued, with some interruptions, into the 1980s. Absolute minimum rainfall level was recorded at many stations in 1983 and 1984. For example, Fig. 4 depicts an event in 1984 at Koutiala weather station where a minimum of 516 mm rainfall was recorded. The period of poor rainfall in the 1970s struck particularly hard for many Sahelian farmers and pastoralists, when there were an estimated 100,000 drought-related deaths . From 1972 to 1984, a severe drought affected Mali. The intersection of vulnerability and variability combined to create a humanitarian disaster and nearly 750,000 became completely dependent on foreign food aid . It was during these periods communities in southern Mali started intensifying shallow well construction in their farming communities. Results are presented below. Summary of studied wells along with year of construction and depth details is presented in Table 2. Table 3 presents the history of shallow wells constructed in each farming community. In Bougouni district, well construction started in 1954 (Madina village) and there were not much wells in the district until 1980. During the 26-year period (1954–1980), the total number of constructed wells in the district was 9 (6 % of the total construction) and all wells were in Madina village. Well construction intensified further only after 20 years (Table 3) where majority of shallow wells (94 %) were constructed from 1980 onwards. Overall observation showed that there was an increasing trend of constructed wells up until 2014, and most notably from 2000 onwards, and with significant variation of well construction (p value 0.021) in Bougouni farming communities. In Koutiala district, the construction of wells dated back to 1900 with one communal well constructed at Zanzoni village. The decadal grouping of the constructed wells revealed that well construction was intensified after 1960, until then only 18 wells (5.5 %) were constructed. In few villages (e.g. Nampossela), majority of wells (82 %) were constructed during 2000–2014. There was an exponential growth of constructed wells in all farming communities after 1960 (Table 3). Majority of wells (56 %) were constructed in the later years (1990–2014). The variation of well construction in the five farming communities was not significant (p value 0.144), implying there was consistent trend of constructing wells in the farming communities of Koutiala district. The minimum recorded well depth was 2.5 m (in Yorobougoula), and the maximum recorded depth was 150 m in Nampossela (Table 4). In all farming communities majority of wells (83 % in Bougouni and 75 % in Koutiala) have depths ranging from 6.5 to 18.5 m. Statistically significant depth variation was observed for wells constructed in Bougouni farming communities (p value 0.043). Only few deeper well depths (>34.5 m) existed in Koutiala, and these were in Nampossela (17 %) and Sirakele (4 %) farming communities. In Bougouni district, the maximum depth recorded was in the range of 18.5–22.5 m and all were in Madina farming community (3.3 %). Seasonal variations of water level in wells are presented in Figs. 7 and 8 for the dry and rainy seasons, respectively. Majority of the wells (75 % in Bougouni, and 70 % in Koutiala) had water available at depths ranging from 5.5 to 15.5 m in the dry season (see details in Fig. 7). For instance, the farming communities of Dieba and Sibirila had water accessible at close range of 5.5 to 9.5 m 70 % of the time. At Madina farming community in majority of wells (76 %), water was available in a close range up to 13.5 m. There was no statistical variation of water level depths in the studied farming communities (p value 0.996) during the dry season. In the rainy season on average 84 % of wells in Bougouni and 94 % of the wells in Koutiala experience water level rise within the range of 0.5–10.5 m (Fig. 8). However, there was no statistical variation of water level rises in the studied communities (p values 0.423/Bougouni and 0.991 Koutiala). Few farming communities are fast recharging zones when compared to others. Sibirila farming community in Bougouni had wells experiencing water level rise to a depth of 4 m 100 % of the time during rainy season. Similarly, farming communities in Koutiala, i.e. Zanzoni, Nampossela and N’Golonianasso, experience water level rise to depth range of 5.5 m from the ground surface 81, 83 and 94 % of the time, respectively (see details in Fig. 8; Table 5). This implies that these farming communities are fast recharging zones, yielding high and can play an important role in buffering farmers against the negative effects of drought conditions. The main use of shallow wells was for household water consumption (domestic) and livestock water demand. As shown in Table 6, at the villages of Dieba and Sibirila, 100 % of well use was for domestic water demand. At Yorobougoula, however, the shallow water well was mainly used for domestic and livestock water needs. This implies that livestock is more important in Yorobougoula than in other farming communities. At Koutiala district, majority of wells (over 89 %) were used for household and livestock purposes. It is surprising to see that only Nampossela farming communities use 6 % of the wells for irrigation activities during the dry season. This implies that shallow wells were important water management structures to satisfy mainly the demands of both household and livestock water needs in the studied farming communities. The data highlighted potential intensification option for crop-livestock activities particularly when wells are fast recharging as observed in the farming communities of Sibirila, Zanzoni, Nampossela and N’Golonianasso. It was important to understand the proportion of household well utilization to assess the presence of adequate water supply. In Bougouni district, 28 % of the wells were shared by five households in each Dieba and Madina, and 33 and 42 % of wells were shared by three households in Flola and five households in Sibirila, respectively. Most of the time, each well was used by more than one household (2–7 households sharing single well). The proportion of single well utilized by one household was Flola (8 %), Yorobougoula (17 %), Madina (10 %), Zanzoni (35 %), Nampossela (15 %), N’Golonianasso (25 %), Sirakele (16 %) and M’Pessoba (28 %). The data showed that more households in Koutiala district own their own well. However, at Bougouni district, sharing of wells was common. In two farming communities of Bougouni district (Dieba and Sibirila), there was no household utilizing only one well, implying all wells are shared resources. This implies that water management structures like that of shallow well were utilized by households in common without major conflict. However, at Yorobougoula farming community 17 % of wells were owned by individual household, a relatively higher figure in Bougouni district showing the increased demand of water. Similar analyses in Koutiala district revealed that most wells were used by 1–3 households. For instance, at Zanzoni village, 78 % of wells were used by one to three households (Table 7). On the contrary, Sirakele village had 38 % of wells being shared by ten households and more. This shows an acute water scarcity in Sirakele village relative to the other villages in Koutiala district. On average, 7 % of the wells were owned by individual households in Bougouni district and the corresponding figure in Koutiala was 24 % (Table 7) signifying more demand of water in Koutiala district. In the studied farming communities excess water in the rainy season and flooding were frequent, but water scarcity in the dry season was apparent. The high intensity of rainfall over a short period and the low organic matter content of the soils and the extent of soils with surface crusts and seals contribute to the loss of water through run-off . 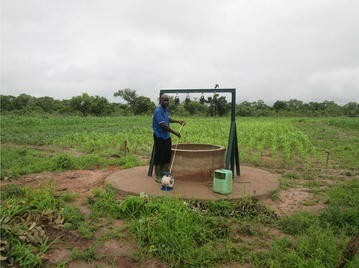 The study of 484 shallow wells in the ten farming communities in southern Mali revealed that shallow wells were important source of water supply for more than 60 years. As population grows demand for more water was evident. The construction of shallow wells was observed to increase exponentially particularly after the 1970s severe drought period with average recorded construction depths ranging from 6.5 to 15.5 m. The seasonal variation of water level showed that during the dry season, water was available from the depth range of 5.5–15.5 m 73 % of the time. In the rainy season, water was available to the depth range of 0.5–10.5 m 89 % of the time. This shows the presence of groundwater at shallow potentially accessible depths in both seasons. Worldwide groundwater has supported growth in agricultural production by allowing farmers to buffer production against the risks associated with variables and uncertain climatic conditions. Groundwater provides a reliable, high quality and accessible source of freshwater that enables farmers to mitigate production risks associated with extreme weather events and climate variability. High-yielding wells may play an important role in buffering farmers against the negative effects of drought condition . Despite the common use of wells at household level, wells were not fully utilized in southern Mali. Hence, water scarcity was common to all studied farming communities. The natural recharging capacities of most wells were found to be satisfactory. In majority of wells, water level rises to the depth of 5.5 m during the rainy season. At dry season, most wells drop their water level to a maximum limit of 15 m. This implies that wells can be recharged easily and can be useful sources of water in all seasons to intensify agricultural productivity and hence food security at household level. The imminent threat to the adequate availability of groundwater resource is the change of climatic condition in the Sahel. Seasonal forecasts are moderately unfavourable with indications of below average rainfall during July–September, the main rainy season in southern Mali . As the climate change continues to threaten the agricultural development and the more water runs off due to high rainfall intensity, the limited soil moisture condition limits plant water and nutrient use efficiency [33, 34]. As a result of likely future increase in rainfall frequency and intensity , the implication is wells may not be recharged satisfactorily and the reduced depth of water levels may constitute a challenge to water access without appropriate groundwater management plan in place. The reductions in well yield will constrain farmers’ ability to use irrigation as an adaptive tool and may have large negative economic impacts on crop-livestock intensification . Presently, there is limited evidence on the likelihood of conflict arising over the use of shallow wells. However, as climate change continues to threaten the region the demand for sustainable supply of water resource is inevitable, requiring proper guidance on groundwater management and utilization plan. Among the many challenges faced by farmers in southern Mali, excess rainwater during the rainy season and water scarcity in the dry season pose the greatest threat to agricultural productivity. Our study on water availability at a spatial scale revealed that shallow wells were important sources of water in rural Mali with adequate recharging capacity during the rainy season and insignificant water level variations in the dry season. Though accessing water from shallow wells was labour-intensive and mostly done by women and the youth, water is available within a reasonable depth from most wells. Thus, the issue of water scarcity in different seasons was attributable to accessibility and this is due to the lack of appropriate water lifting mechanisms. If access to wells is improved, farmers diversify their nutrition intake by growing vegetables and high-yielding crops near the wells, thus increasing the food security and household income. In addition, availability of water in the dry season would mean farmers produce more fodder for livestock productivity. The high-yielding wells identified in Sibirila, Zanzoni, Nampossela and N’Golonianasso play an important role to intensify crop-livestock productivity. In addition, these wells help farmers to buffer against the negative effects of drought condition. Finally, groundwater was an untapped resource in Mali requiring due attention along with other management practices to enable farmers cope with the changing climate condition of the Sahel. Name of the company is only for reference purposes, and the authors/ICRISAT do not endorse any company or its product/services. BZB developed the outline and drafted the manuscript. RT contributed to the evolving outline and writing of the manuscript. Both authors read and approved the final manuscript. This study was supported by Africa RISING program in West Africa. Authors are very grateful to the financial support provided by USAID through IITA, which is the leader of the program in West Africa. We would like to thank Dr. Anthony Whitbread, ICRISAT Research Program Director for reviewing the first draft of the manuscript and for suggesting areas of improvement. We are also grateful to the two anonymous reviewers who reviewed the manuscript and provided useful suggestions to improve the contents. We appreciate the effort made by Mr. Cedrick Guedessou, Mr. Dicko Mahamodaou, Mr. Karamoko Traore, Mr. Sidi Toure, Mr. Marc Traore and members of the ten farming communities in southern Mali in availing data for the study. We are thankful to Dr. Carlos Azzari (from IFPRI) who provided the GIS map of the ten farming communities in southern Mali. Dr. Birhanu Zemadim Birhanu is a Land and Water Management Scientist and Project Manager at the International Crops Research Institute of the Semi-Arid Tropics (ICRISAT) in West and Central Africa (WCA). His field of study focuses on improving agricultural productivity and livelihood improvements through availing best-proven innovation practices to rural communities. Dr. Ramadjita Tabo is an Agronomist by profession and is a Principal Investigator of the Africa RISING project in Mali. He is also the head of ICRISAT WCA. His field of study focuses on availing best agronomic practices to the rural communities to improve their resilience towards climate shock and improve the livelihood. The International Monetary Fund (IMF). Mali poverty reduction strategy paper. Country Report No. 13/111. 2013. http://www.imf.org/external/pubs/ft/scr/2013/cr13111.pdf. Accessed 4 Mar 2015. Valenghi D, Guenat D. Coton Biologique au Mali. Document de programme. Helvetas-Mali: Association suisse pour la coopération internationale Programme d’Appui aux Initiatives des Producteurs et Productrices Agricoles; 2001. http://hubrural.org/IMG/pdf/doc-projet-coton-bio-mali.pdf. (Accessed 04 Mar 2015). Jalloh A, Nelson GC, Thomas TS, Zougmoré R, Roy-Macauley H. West African agriculture and climate change: a comprehensive analysis. Washington, DC: IFPRI Books and Research Monographs; 2013. ISBN: 978-0-89629-204-8. doi:10.2499/9780896292048. Sanogo Y. Commerce équitable et développement durable : la filière coton au Mali. Co-publication de l’ARUC-ISDC, de la Chaire de recherche du Canada en développement des collectivités et de la CRSDD, en collaboration avec le CECI, Série Recherches, no. 4, Université du Québec en Outaouais; 2007. pp 60. http://www4.uqo.ca/observer/EconSoc/Solidarite/CommerceEquitable/Coton.htm. Accessed 4 Mar 2015. Winterbottom R, Reij C, Garrity D, Glover J, Hellums D, Mcgahuey M, Scherr S. Improving land and water management. Working Paper, installment 4 of creating a sustainable food future. Washington, DC: World Resources Institute; 2013. http://www.worldresourcesreport.org. Serigne TK, Louis V, Jens M. Climate change and variability in the Sahel region: impacts and adaptation strategies in the agricultural sector. A document produced by Word Agroforestry Centre (ICRAF), and the United Nations Environment Programme (UNEP); 2006. pp 58. https://www.scribd.com/doc/299921544/Climate-Change. Accessed 15 Apr 2015. Zemadim B. Contours of a success story, expanding contour bunding technology for improved livelihood benefits in Mali, Inclusive market oriented development. Demand driven innovation benefitting the poor. ICRISAT IMOD Ex. 2015;2:75–82. http://www.icrisat.org/PDF/IMOD-Exemplars-Volume-II.pdf. Zemadim B, Tabo R, Sogoba B, Nicolas F, Wani SP. Assessment of contour bunding technology for improved land and water management in Mali. Resilient dryland systems research Report No. 63. Patancheru: International Crops Research Institute for the Semi-Arid Tropics (ICRISAT); 2014. p. 34. http://oar.icrisat.org/8763/1/RDS%20Research%20Report.pdf. Foster T, et al. Why well yield matters for managing agricultural drought risk. Weather Clim Extrem. 2015. doi:10.1016/j.wace.2015.07.003. CIESIN Center for International Earth Science Information Network—Columbia University, and Centro Internacional de Agricultura Tropical—CIAT. Gridded population of the world, version 3 (GPWv3): population density grid, future estimates. Palisades: NASA Socioeconomic Data and Applications Center (SEDAC); 2005. doi:10.7927/H4ST7MRB. (Accessed 06 Apr 2016). Batterbury S. The Sahel region: assessing progress twenty-five years after the great drought, republished paper from 1998 RGS-IBG conference. Glob Environ Change. 2001;11:1–95. http://www.simonbatterbury.net/pubs/geogmag.html. Khan B. Informing farmers and combating drought in Mali. International Research Institute for Climate and Society. State of the Planet. Columbia University; 2011. http://blogs.ei.columbia.edu/2011/04/13/informing-farmers-and-combatting-drought-in-mali/. Accessed 5 June 2015. Bonifacio R. West Africa: the 2015 season. Vam Food Security Analysis; 2015. pp 17. http://documents.wfp.org/stellent/groups/public/documents/ena/wfp276236.pdf. Accessed 9 July 2015.